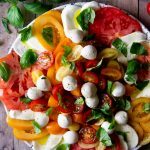 The most famous Italian salad ever is of course, the classic caprese salad. It's easy, fresh and delicious whether eaten as a side or light lunch this salad is the ultimate way to enjoy fresh, ripe summer tomatoes! Slice the tomatoes. I like to find different shapes, sizes and colours to make the salad more fun and vibrant. Then slice the mozzarella in thick slices. I used a mixture of buffalo mozzarella and bocconcini di mozzarella, again it makes it a more fun and exciting especially if you're making it for a crowd! Arrange one or two slices of tomato then overlap with slices of mozzarella around the outside of a plate. Fill the inside with chopped cherry tomatoes and baby mozzarella. If you're not using cherry tomatoes and baby mozzarella then continue in circles until you've covered the plate. Finally scatter over freshly torn basil leaves and a good drizzle of high quality extra virgin olive oil, sea salt flakes and freshly ground pepper. If you live in the UK, US or somewhere else far away from Italy there's no point in trying to source Italian tomatoes. If I've learned anything living in Italy it's that the good stuff tends to stay in Italy.. I mean why would they ship their very best tomatoes anywhere else? The freshest, juiciest tomatoes are on your very own doorstep, grown locally! Go to farmer's markets and find the very best you can. For the best Caprese Salad it's SO worth it! Don't settle for watery, tasteless tomatoes often found in supermarkets. When tomatoes are your main ingredient they have to taste good. The only cheese to use is mozzarella! I like to use buffalo mozzarella. Again if you go for the cheapest mozzarella you can find it probably won't be great. The amount of times I've bought mozzarella and it's like a rubber ball, meh. You can also use burrata which is a rich cream filled mozzarella (basically heaven) or bocconcini di mozzarella (baby ones). The baby ones can be a little harder to find but add a fun twist.